Sift the flour and salt and mix the rest of the ingredients with 1 tsp. Ghee(clarified butter). Make a soft dough using water and knead well until it forma a soft dough. Divide the dough into equal balls and roll out each ball into a round puri. 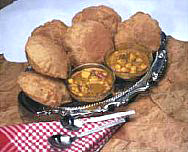 Heat Ghee(clarified butter) in a frying pan and fry 1-2 puris at a time until it turns golden brown.